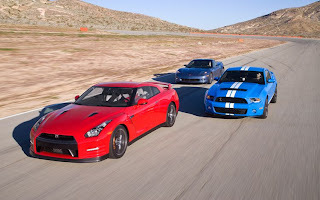 Motor Trend pitted three high end performance cars together in a recent comparison. The new 2012 Nissan GT-R is getting set to be released to the public here in the US on Feburary 21. These three cars, two from the US, and one from Japan, show you don't need to spend supercar money, to get supercar performance. The Mustang came at the low end of the price scale, and if you checked out the lap times from my last post, it is pretty quick on the road course. 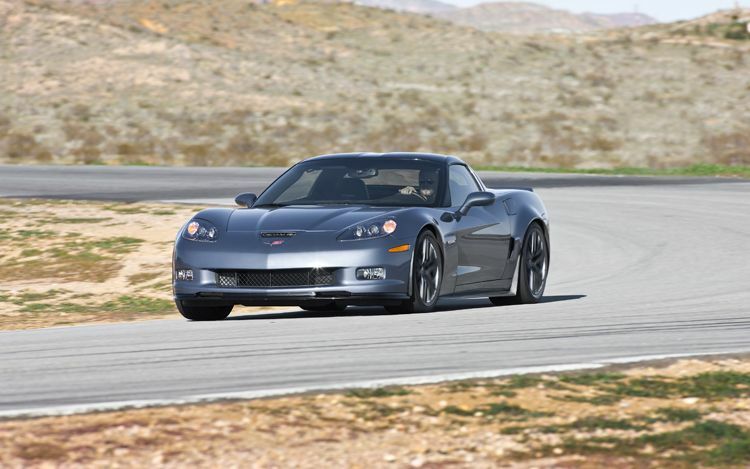 Our tester benefited from an SVT Performance Package that adds a sportier 3.73 rear end, stiffer springs, and Goodyear Eagle F1 Supercar G: 2 tires, all in the name of improved lap times for the live-axle, 3801-pound pony car. Total cost for this mightiest of Mustangs? A basement $55,330. 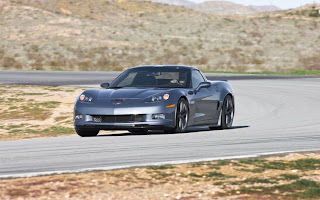 The Chevrolet Corvette in this test, takes some of the best parts of the ZR1, adds it to the normally aspirated 427 cubic inch engine in the Z06, and comes in as a lightweight $98,010 special. The new Nissan GT-R goes 0-60 in 2.9 seconds, and 11.2@122.7 in the quarter mile. The 2012 GT-R's handling has been improved significantly according to most of the testers that have driven the car. Like any car, this can still be further improved to better suit some tracks. From Randy Pobst's impressions of the 2012 GT-R, it still needs some help in the braking department.
. "The shifts are far quicker than they are in the Mustang and the Corvette. Those regular 6-speeds feel like antiques." Plus, the '12 GT-R is now happy to rotate rather than lightly understeer out of a turn like the '11. "Tail came out but in a beautiful, predictable, no-fear way. And a no-fear rotation -- that's very hard to create in a car."